When you are throwing a big party, the usual measure of success is whether all good time was had by all. 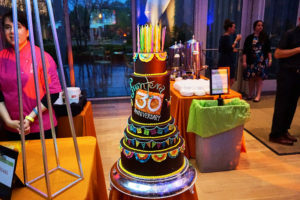 By that standard, the Frontera 30th Anniversary Celebration — marking three decades of Chicago Chef Rick Bayless‘ Frontera Grill — was a dazzling success. More than 700 guests enjoyed an engaging and informative Good Food Forum at The Art Institute of Chicago’s Rubloff Auditorium. 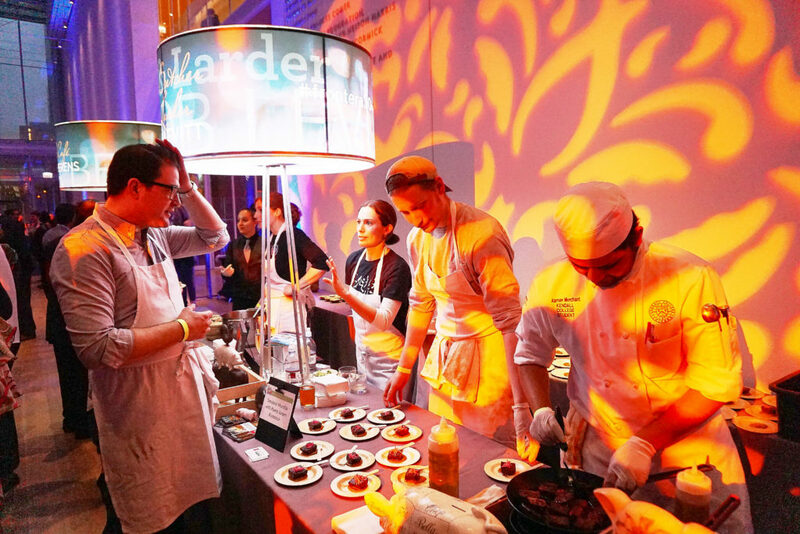 Then they segued to Griffin Court in the Modern Wing for the Good Food Party of the Year, with Rick’s Frontera restaurant team and more than a dozen world-class chefs providing edible art. But the Frontera 30th Celebration was more than a feast. It was a fundraiser for Rick’s Frontera Farmer Foundation, which has issued more than $2 million in grants to Midwestern small farmers to help them build their businesses, and FamilyFarmed, a Chicago-based nonprofit, which works to accelerate the rise of the Good Food movement by providing technical assistance, training, and networking connections to farm and food entrepreneurs. So the Celebration had to raise money to enable both organizations to expand their ongoing missions. And by that standard… the event also was a big success, netting more than $100,000 that will be divided evenly between the two organizations. The proceeds resulted from ticket sales, sponsorships, host committee donations, and successful bids in an extraordinary silent auction. 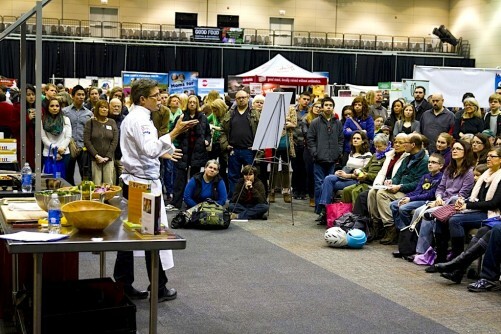 The prizes includes a food tour in Mexico with Rick Bayless and his Frontera crew; a home pop-up dinner for 30 prepared by Frontera; a pig roast for 100 people prepared by Indiana’s Gunthorp Farms, a leading sustainable livestock producer; and much more. 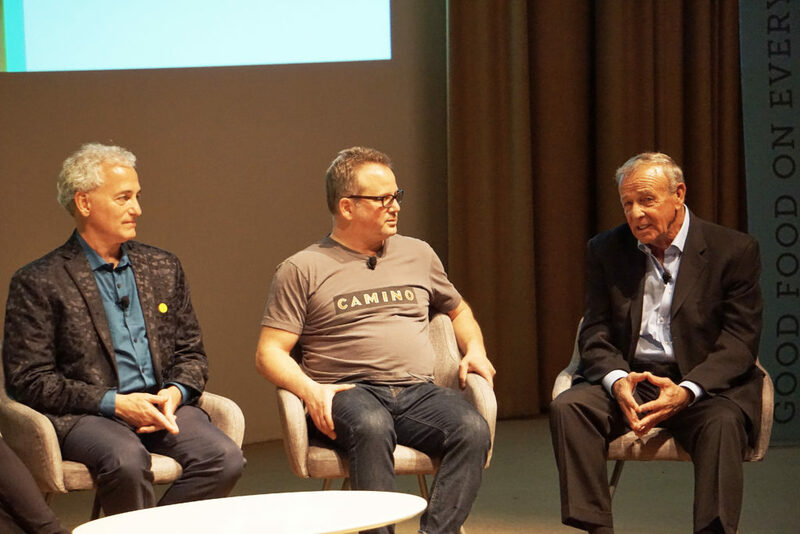 FamilyFarmed and Frontera Farmer Foundation are enormously grateful to everyone who participated in and contributed to the most ambitious event that either organization has taken on to date. What the guests received in return was an amazing selection of savory and sweet treats from Chicago culinary leaders (in reverse alphabetical order for variety): Erling Wu-Bower (Nico Osteria); Mindy Segal (Mindy’s HotChocolate); Anselmo Ramirez (Ixcateco Grill); Matthias Merges (Yusho, Billy Sunday, A10, Old Irving Brewing); Rob Levitt (The Butcher & Larder at Local Foods); Stephanie Izard (Girl & The Goat, Little Goat Diner, Duck Duck Goat); Jason Hammel (Lula Cafe); Cosmo Goss (The Publican); Mindy Gohr (Bittersweet Pastry Shop & Café); Abe Conlon (Fat Rice); Abra Berens (Stock Café at Local Foods); Brent Balika (soon to open Margeaux Brasserie at the Waldorf Astoria); and Johnny Anderes (The Kitchen). 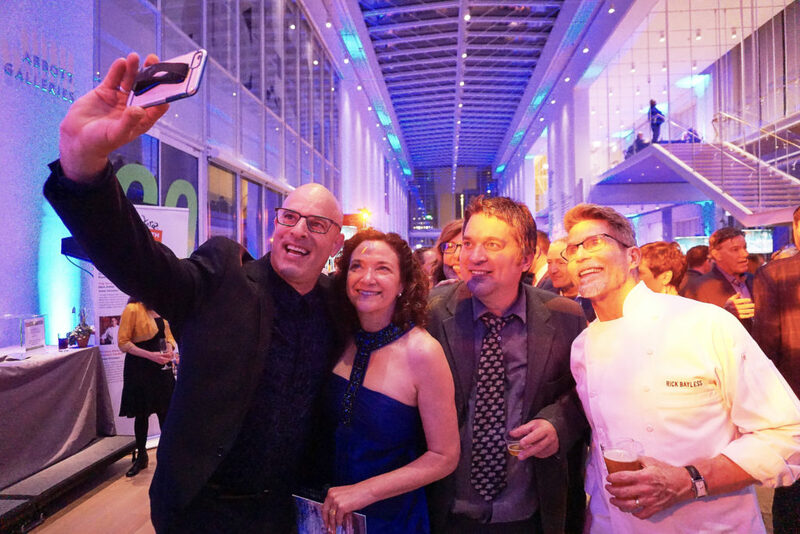 Flying in to salute Rick Bayless were Ming Tsai of the Boston area’s Blue Ginger and Blue Dragon and public television’s Simply Ming cooking show, and Josephina Santacruz of Mexico City’s Restaurante Sesame. Good Food on Every Table on May 3 published a photo essay showing all of the chefs in action at Frontera 30, which can be found by clicking here. The article also includes links to a series of profiles of the chefs published on the site in the run-up to the Celebration. Add in great beverages and live Mexican folk music, and we had an event that numerous attendees did not want to leave at the end of the evening. “I’m grateful for all of you who are in this audience sharing this momentous occasion with us. But I’m also just simply grateful for Chicago that has welcomed us for these three decades and supported the work that I have done. I’m incredibly grateful to my wife [Deann], who has been the backbone of our operation, and I would like to ask her to stand along with our daughter Lanie and my new son-in-law Kevin. I may be the face of so much of what we do, but these are the people who really keep it all going and tie up all of those ends, and sometimes look at me when I have another one of my hare-brained ideas, and say, “Oh, come on.” So I’m incredibly grateful for that. The Forum was then capped by a panel discussion moderated by Peter Sagal of NPR’s popular “Wait, Wait… Don’t Tell Me” show and featuring two more legendary chefs — Paul Kahan of Chicago’s One Off Hospitality Group (Blackbird, avec, The Publican, Publican Quality Meats, Publican Quality Bread, Nico Osteria, Big Star, The Violet Hour, Dove’s Luncheonette, Publican Anker and Publican Tavern at O’Hare International Airport) and Nora Pouillon, whose nearly 40 years at Restaurant Nora (the nation’s first certified organic restaurant) earned her this year’s James Beard Lifetime Achievement Award. 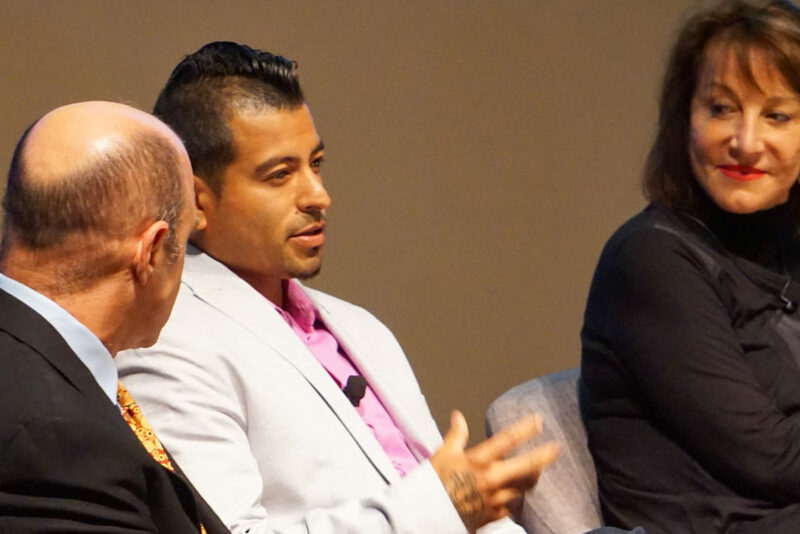 The panel also included Fedele Bauccio, whose Bon Appetit Management Company challenged the mediocrity of most institutional food by catering delicious and sustainable preparations; Eduardo Rivera, a Mexican-immigrant farmer in Minnesota who was a 2016 recipient of a Frontera Farmer Foundation grant; and Jim Slama, founder, president and CEO of FamilyFarmed. 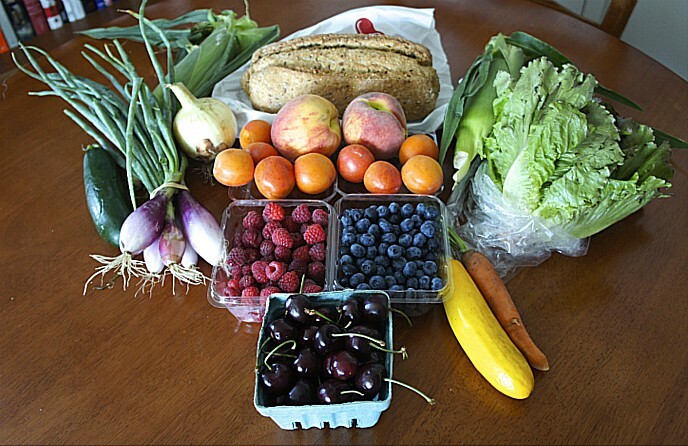 This entry was posted in Awards, Chef activism, Chef advocacy, Family Farms, Farm businesses, Farm to table dining, Food activism, Food and community, Food education, Food Entrepreneurs, Frontera 30th Anniversary Celebration, Frontera Farmer Foundation, Good Food business development, Good Food Dining, Good Food restaurant trends, Good Food Success Stories, James Beard Foundation Awards, Local Food, Restaurants and Good Food, Small Farmers, Sustainable dining, Sustainable food education and tagged A10 Chicago, Abe Conlon Chicago, Abra Berens, Anselmo Ramirez, Billy Sunday Chicago, Bittersweet Pastry Shop & Cafe, Blue Dragon, Blue Ginger, Bon Appetit Management Company, Brent Balika, Chef Rick Bayless, Cosmo Goss, Duck Duck Goat, Eduardo Rivera farmer, Erling Wu-Bower, FamilyFarmed, Fat Rice, Fedele Bauccio, Frontera 30th Anniversary Celebration, Frontera Farmer Foundation, Frontera Grill, Girl & The Goat, Gunthorp Farms, Ixcateco Grill, James Beard Foundation Awards, Jason Hammel chef, Jim Slama, Johnny Anderes, Josephina Santacruz, Little Goat Diner, Local Foods Chicago, Lula Cafe, Matthias Merges, Mindy Gohr, Mindy Segal, Mindy's HotChocolate, Ming Tsai, Nico Osteria, Nora Pouillon, NPR, Old Irving Brewing Company, One Off Hospitality Group, Paul Kahan, Peter Sagal, Restaurant Nora, Restaurante Sesame, Rob Levitt, Simply Ming, Sin Fronteras farm Minnesota, Stephanie Izard, Stock Cafe at Local Foods, The Art Institute of Chicago, The Butcher & Larder, The Kitchen Chicago, The Publican, Topolobampo, Wait Wait Don't Tell Me, Waldorf Astoria Chicago, Yusho. Bookmark the permalink.